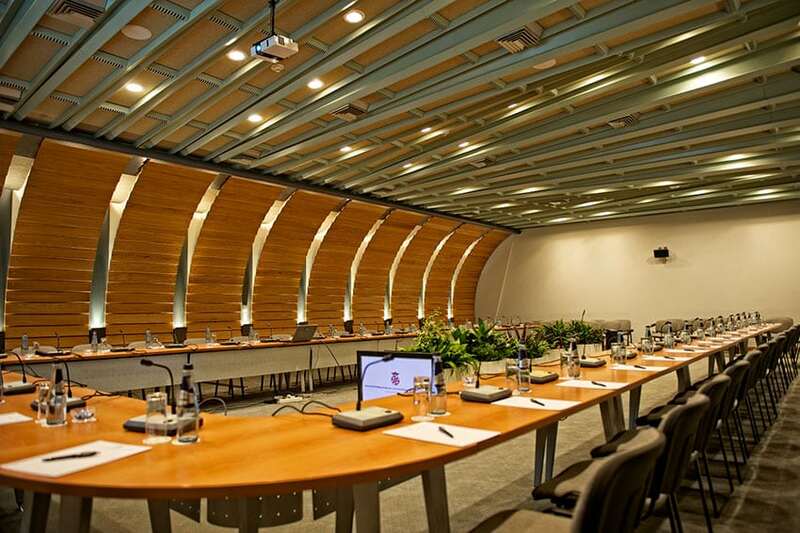 Malta’s Business Venue Located on the periphery of the historical city of Valletta and overlooking the Grand Harbour, the Mediterranean Conference Centre is a 16th Century building formerly known as the ‘Sacra Infermeria’ of the Order of St. John. The MCC, the largest Conference Centre on the Island of Malta, boasts a total of 8 halls over an area of 7,000 sq. metres with a capacity ranging from 15 to 1,400. No matter what the size of the event being organised – from a small presentation to a large conference, a product launch or an exhibition, a convention or even a theatrical performance – the Mediterranean Conference Centre can cater for all your requirements. The Mediterranean Conference Centre, with its special features, is truly unique. The Mediterranean Conference Centre is undoubtedly firmly established as one of the most impressive conference centres in all of Europe. The Centre’s historic background and imposing architecture no doubt play a very important role in securing the position it enjoys today. For over two centuries, the building that now houses the Mediterranean Conference Centre was the ‘Sacra Infermeria’ or Holy Infirmary of the Order of St. John. Constructed in the latter part of the 16th Century, this architectural landmark has had a fascinating history during which it was subject to various transformations as it changed to accommodate the needs of the day. The Mediterranean Conference Centre, with its special features, is truly unique. Away from the cluttered environment of high-rise meeting places and far from the din of endless traffic jams, the Mediterranean Conference Centre has all the benefits of ultra modern technology set in an oasis of historical tranquillity. The Mediterranean Conference Centre boasts a total of eight halls and eight syndicate rooms over an area of 7,000 square metres. Each meeting hall is equipped with its own independent sound, lighting and climate control. Conference facilities include permanent installations for simultaneous interpretation for up to six languages, ADSL, Wi-Fi as well as audio / visual equipment. The Centre can accommodate over 2,300 delegates in all the conference halls. The impressive and imposing Republic Hall has been constructed in place of what once was the Main Courtyard of the ‘Sacra Infermeria’. Its large area, 728 square metres, is tastefully roofed over and has created Malta’s largest Auditorium. With a seating capacity of 1,400, this elegant theatre style hall is the largest in the Conference Centre. It is ideal for large-scale meetings or conferences and is equipped with theatre lighting and sound systems, audio/visual facilities as well as simultaneous interpretation for up to six languages. At 155 metres in length, ‘Sacra Infermeria’ is the main exhibition hall of the Centre. This magnificent Hall is also regularly used for banqueting functions accommodating up to 1,500 persons comfortably seated, or over 2,500 for stand-up cocktail receptions. It covers a total area of 1,700 square metres. This hall was once the Long Ward of the ‘Sacra Infermeria’. It is one of the longest halls in Europe and was recognised as an architectural feat in the 16th century when it was constructed. The La Valette Banqueting Hall is unique on the Island in many respects. With a seating capacity of about 900 persons it is the largest in Malta covering an area of about 1500 sq. metres. Its massive yet graceful vaulted ceiling is most impressive. Quaint 400 year – old frescos have been restored; candle torches, coat-of-arms of the Knights of Malta set the scene for formal dinners and elegant banquets. It is, however, not the technology and the facilities alone that make a success of an occasion. The Mediterranean Conference Centre prides itself on the level of customer support service it offers through its dedicated and highly motivated staff.